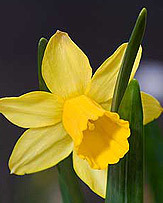 The Hoop petticoat daffodil are Narcissus bulbocodium, these are daffodils with small flowers, however they do have relatively large conical coronas. It is these large rounded coronas that gives these plants the unlikely common name of "hoop-petticoat". These fascinating little plants include two species, a number of sub species and dozens of hybridised cultivars. 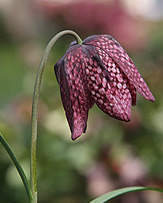 The flowers may not be the big showy type however they are fascinating, dainty and attractive. 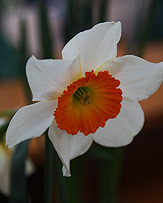 We consider them the 'Tiny Treasures' of the world of daffodils. Originally from the mountains and foothills of Mediteranean countries including Spain, and Portugal as well as nearby countries in Northern Africa, Narcissus bulbocodium are now grown widely around the world. They are a varied group, some with wide flaring coronas, others with rather narrow coronas. 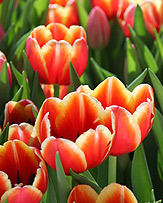 Some will flower in late autumn, others through winter to spring. Flowering time depends a lot on the climate, as well as the species, warmer areas will see flowers in late autumn on a regular basis. And if you are growing these wonderful plants in an alpine house, you will have a little more control. All require a well drained soil and a sunny position. Some varieties will cope better with cold winters than others, the North African types will require some protection. All require a dry summer dormancy. You will find that the cooler growing types will naturalise well into lawns and meadows, pushing up flowers on tall stems in early spring. Many gardeners choose to grow Narcissus bulbocodium in containers, this gives them a chance to show off the flowers and have a little more control over growth habit. However at least 12 sub species (ssp) are named and with flower color s varying from buttercup yellow to clear lemon and white they a re certainly an attractive group of flowering bulbs. Literally hundreds of cultivars are grown as well, a number of gardeners are fascinineted by this group and have been hybridising them for many years. So although Narcissus bulbocodium or 'Hoop petticoat daffodils' do have small flowers, they are attractive yet easy to grow.